Famous people born on OCTOBER 12 keep it on the down low. When they spend too much, they usually don’t tell a soul. I’m just joking… I know they like to have a little diversion from time to time but nothing to extreme. Spending money they don’t have could be the downfall of this Libra. Having a large salary will do them no good if they don’t know how to manage their money. Being born on this day suggests that these famous October 12 celebrities could have a couple of different personalities. They are indecisive one day and very adamant the next. Additionally, they don’t handle stress well. They tend to drag their feet when chaos rears its ugly head. Having to think too much wears them out. They’re exhausted by the end of the crisis. Having a trusted friend to share the load with makes a big difference in the lives of the famous October 12 born. Their friends and family are usually the ones to come to them with their mischief-making stories. They tend to take life as it comes and leave the judgments up to someone else. 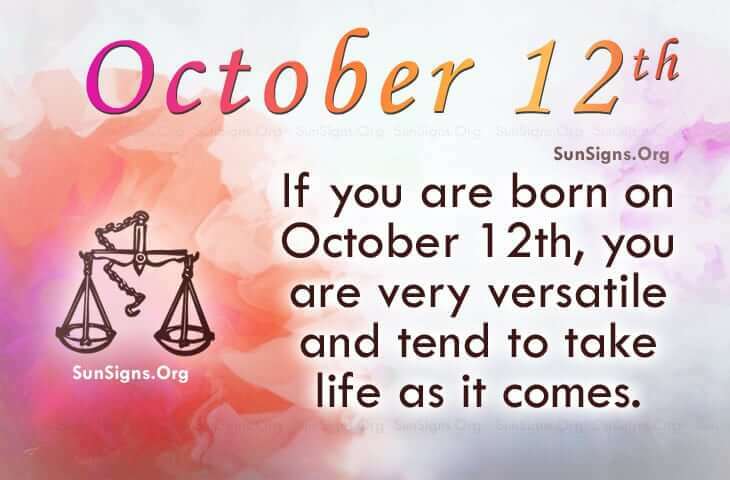 Famous people born on OCTOBER 12th have dual personalities. One day they behave this way but the next, they are not the same as the day before. They are intelligent but they may be easily influenced. They love food so they need to watch their weight.